I've been professional body painter. Make up Artist. Photographer and Professional international Visual Artist with 25 yrs of experience behind my belt. I'm a professional body painter with a licensed red seal trade esthetics in province of Manitoba for the 13 yrs, with over 25 yrs of experience in many levels of my industry as a Visual Artist. 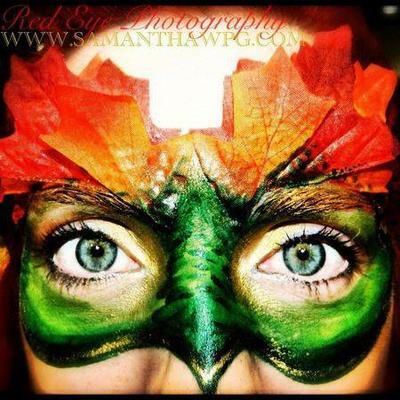 Samantha has achieved many levels of award and international multi media for my work as an independent Freelance Artist. I've been professional body painter.Make up Artist.Photographer and Professional International Model with 25 yrs of experience behind my belt. I can be available for fundraiser, fashion shows, photo shoots, kids parties or what events are needed for your industry. 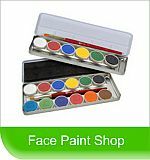 approved in the body painting industry. professional experience of your projects. I had been planning my holloween costume for almost two years, and Sam made my joker come to life. I hadn't ever had a good make up job done and that's what I received from Sam. She gave me her time and effort and I am thankful, and I look forward to contacting her next Halloween. Love you and thank you so much! I had a UV back body piece done by Samantha a little while ago it was a first experience for me getting body paint work done. Samantha made sure I was comfortable the whole time and had plenty of water to keep me hydrated. The overall experience was absolutely amazing Samantha was so easy to get along with and has so many different creative idea's flowing. She is amazing to collaborate with. I would definitely recommend her to any friends looking for a new experience as their first time experiencing body paint. I couldn't get enough working with Samantha the first time the experience was so great that I just had to try a new shoot with her. I have the pleasure of working at the upcoming Winnipeg comic con with Sam and we did a promotional photo shoot where I was able to cosplay as Mary Jane Watson of spider-man. Not only was she amazingly talented in her body painting, her skill in photography was amazing to expand my modeling portfolio. I have had so much positive feedback on her amazing work. I look forward to working with her again in the future and will absolutely recommend her to all of my cosplay friends. I went to see Samantha WPG at C4 Comic Con this year and she did a superman tattoo (non Permanent) on my forearm. It was such a fenominal job as always. Samantha, you rocked Comic Con!! 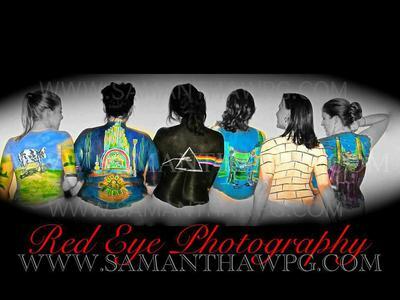 Samantha Wpg is by far the best body painter in Winnipeg!! Samantha Wpg is not only a great friend of mine but an amazing artist. She always goes above and beyond any expectations. I was an absolute hit one year that Sam body painted me and always look forward to seeing and being a part of the work she does. 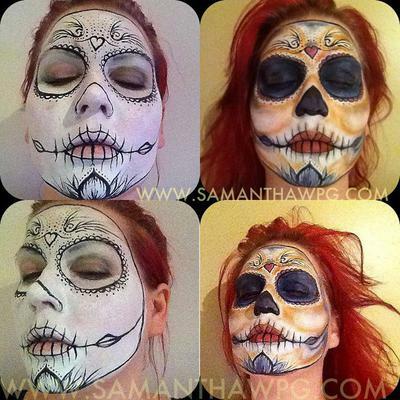 Sam is not only fantastic with her design and ideas, but she is also one of the gentlest painters I've worked with. Quality and comfort! She painted me for C4 con and it was the most fantastic time! People could not tell it was painted because it was so realistic and well done. Book her today! Wonderful experience working with Sam!! She first painted me full body for Marti gras, and then my upper half for comic con, as well as my lower half (painted on jeans) for a photoshoot. Getting painted is like being in a second skin and always makes for a great time no matter what the event. I would highly recommend Sam for any occasion as I have been nothing but thrilled with all of her results! Can't wait to work with you again Sam!! Just dropping a line to say thank you for the concrete minerals make up its absolutely wonderful. It's very vibrant, and goes on amazing! Thanks again! Can't wait for you at C4 Comic Con!! Looking forward to your appearance at C4 Comic Con in Winnipeg again. Your the best body painter, better then the other one who just does hena. hey sam!! my god last night was awesome and thank you again so much. You did an amazing job on all of us! thank you again! Samantha you were FANTASTIC to work with! Samantha Wpg you were FANTASTIC to work with! As one of the models for this image, I have to say how comfortable and fun it was to work with you. You are extremely talented and when we went out to Gios later that evening to show off your work... we were swarmed by admirers. Winnipeg is lucky to have you as a fun-loving, talented body artist.